Tis the season! And now that all the shopping, cheer and festivities are well underway, it’s a good time to make yourself aware of some of the most common schemes that are taking place throughout the country. Because although this is the time of year to spread kindness and joy, there are unscrupulous folks out there just waiting to take advantage of unsuspecting victims. Social media and email scams that invite and entice you to get deep discounts on the season’s most popular toys or gifts are often a guise for scammers looking to steal your identity or personal information. Be aware of websites that may look like the real thing but contain retailer names that are misspelled, or that have no address, phone number or other company information. If there’s no return policy listed, if shipping info isn’t available or the prices seem too good to be true, be very careful. When placing an order on a legitimate site, the URL should have https: before the page or site id, if there’s no “s”, it could mean you’re not on a secure server and therefore, your debit, credit card, and other information could be at risk. The holidays are rife with offers for everything from free iPhones to cruises and more—but many of these freebies are anything but. Many of them are a trick to get you to click on a link that will subsequently install malware on your computer or take you to a site where you’ll be asked to enter in personal information to claim the prize. These scams are a way to capture your information and use it to steal your identity. Also, free offers that ask you for your credit card number for shipping or as a deposit are usually bogus and should be avoided. All of us have been asked to fill out a survey after a purchase or have a service performed. But emails and texts that seem to come out of nowhere—yet promise a free gift, a gift card or even products just for filling out the survey, are a red flag and it’s best to ignore them. These fake surveys are designed to grab your personal information and use it in an identity theft scheme or to sell to other scammers who pay for this type of data and will use it against you later. Delete these types of correspondence right away and never click on embedded links. 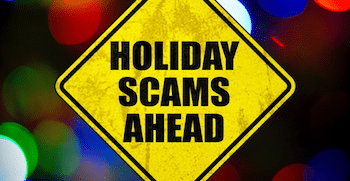 Identity theft and scams are always out there—but during the holiday season, they are even more prevalent. Familiarize yourself with the most popular ones happening today to protect yourself and your family. Nothing puts a damper on the fun more than having your identity and/or bank account compromised. To learn more about ID theft and how shredding unwanted and unneeded documents and devices can protect you, talk to us at All Points Mobile Shredding. Our family owned and operated company will come to your home or office to serve you, whether it’s a one-time shred or a consistent schedule. Give us a call at 772.283.4152 or fill out our quote request form for more information. ← Shopping on Black Friday?